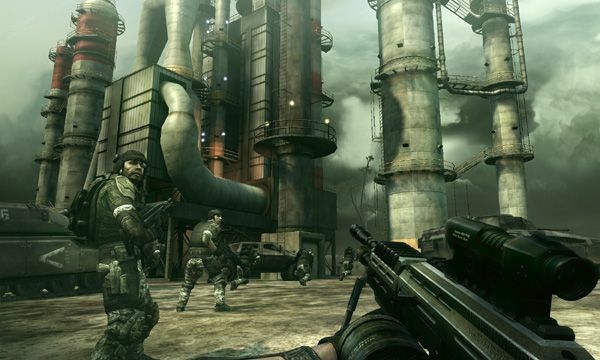 Frontlines: Fuel of War is a first-person shooter game for the Xbox 360, PlayStation 3 and Microsoft Windows. It is being produced by Kaos Studios, previously known as Trauma Studios, who produced Desert Combat, an extremely popular modification for Battlefield 1942. The roles are as follows: Ground Support, EMP tech, Drone Tech, and Air Support. The roles are upgradeable thrice, in an RPG style twist. The levels will presumably unlock better equipment, and make the player harder to kill. Frontlines also has an interesting bonus role. It is Artillery Support. This bonus role requires the player to scout out positions and mark the area in the mission. To unlock this bonus you must finish the game on the hardest level of gameplay. THQ recently announced the launch of an alternate reality game (ARG) for Frontlines: Fuel of War in order to promote the game via the website http://www.exeoinc.com. Visitors are challenged to unearth the mystery surrounding Exeo Incorporated by finding ten passwords scattered across the net. Once players find all ten, they qualify for real fighter-pilot training at Air Combat USA, plus a free copy of Frontlines: Fuel of War.